Experience the power taiko (Japanese drumming) has to bring people together with The Genki Spark. One year after the election, The Genki Spark ask, "How can we build communities of respect?" Through performance, spoken word, creative story telling, and audience engagement come meet new people, share your thoughts, get inspired, and contribute to creating a positive environment. Suggested Donation of $10 to support the performance. THIS PERFORMANCE IS SOLD OUT! LIMITED NUMBER WALK INS MAY BE AVAILABLE FIRST COME FIRST SERVE. Launched the summer of 2010 with a workshop hosted by the Asian American women's organization, ASPIRE and a performance with the Boston Asian American Film Festival, The Genki Spark is a multi-generational, pan-Asian women's arts and advocacy organization that uses taiko drumming, personal stories, and creativity to build community, develop leadership, and promote respect for all. The Genki Spark has provided programming for hundreds of universities and schools, community events, and cultural celebrations throughout the greater Boston area and as far as California and the UK. 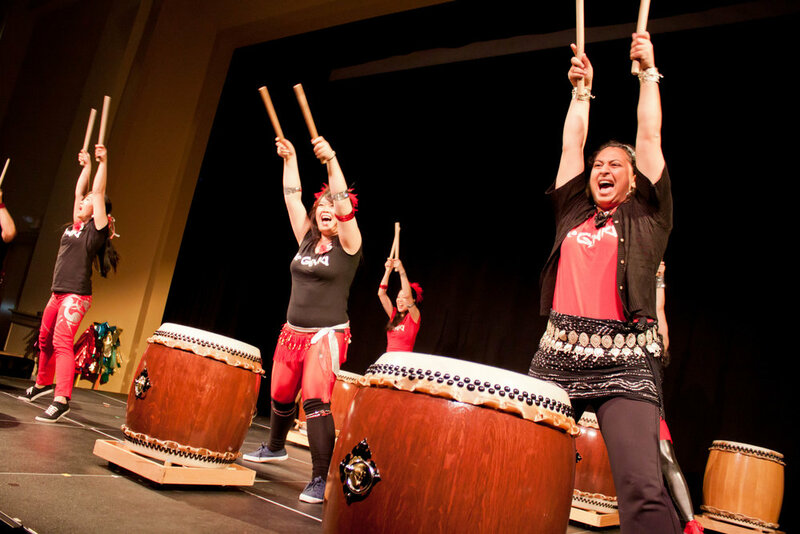 They are celebrated and recognized as a leader in the greater North American and International taiko community.